Jazz Suite in Color for solo piano is an arrangement of the original Jazz Suite in Color, a trio for clarinet, trumpet, and piano. 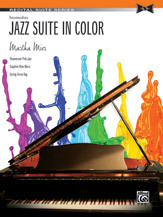 Now solo pianists can enjoy this exciting mix of jazz styles painted musically with a splash of color. As in the original, there are three movements, each with a distinctive jazz style. The first movement projects a jazzy feeling of celebration and happiness. The second movement is calm and serene, yet depicts the sadness of the blues. The third movement is a happy and carefree ragtime piece. Movements: Fluorescent Pink Jazz * Sapphire Blue Blues * Spring Green Rag.